GoGoCycles invites you to advertise your 1984 Honda Goldwing for sale in our FREE motorcycle classifieds. If you haven't ridden your Aspencade or GL1200 in a while or just need to raise some cash to put towards your next motorcycle, we are happy to help you sell your motorcycle. Be sure to mention and upgraded motorcycle parts and accessories including that seat that you replaced with one that was more comfortable, the new exhaust pipes or the new windshield so that potential buyers of your Aspencade or GL1200 will know exactly what they will be getting especially if they are not featured in the pictures on your ad. You can sell as many 1984 Honda Goldwings, Goldwing Aspencades or GL1200s on GoGoCycles Used Motorcycle Classifieds) as you like but we do ask that you follow a few rules. SELL YOUR USED 1984 HONDA GOLDWING! When you list your 1984 Honda Goldwing for sale, we ask that you please provide enough information to make potential buyers comfortable and confident that you aren't running some kind of scam which includes posting as many as four pictures of the Goldwing that you have for sale plus any details like upgraded parts (including retail cost and cost to install if you like), condition of the motorcycle, your asking price, whether or not you would be willing to accept offers or if the price is firm and you would prefer not to be contacted excepted by serious buyers willing to pay your price, a general location for shipping purposes (your zip code, state or city will do) and MOST IMPORTANTLY a means of contacting you. 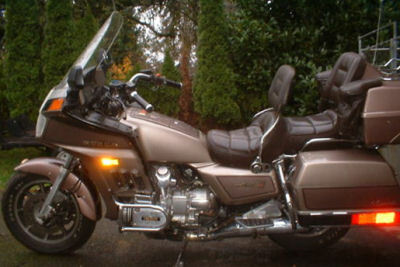 An email address, a phone number or some means of contact is very important since how can you make a deal to sell the 1984 Honda Goldwing Aspencade when the biker that's interested has no way of getting in touch with you to request more photos or ask you any questions before he or she feels good about coughing up your asking price? Take a look at the hundreds of reviews and comments left on ads right here on this website where potential buyers are begging for an email address, phone number or even for the seller to get back with them with more information on their 1984 Honda Goldwing for sale that they are interested in buying. Imagine how frustrating it is to finally find that Aspencade or GL1200 only to be unable to talk to the guy who posted the ad. My next and last request would be that when your 1984 Goldwing is no longer for sale, please leave a comment on your ad and let me know so that I can mark the motorcycle as sold. I will leave your 1984 Goldwing classified up until you tell me that you've made a sale, which eliminates the need to constantly post your ad like you would if you were posting your Goldwing for sale on Craigslist or Ebay. If a lot of time has passed or somebody starts complaining that the classified is so old that it's insulting to believe that it's still available, I will remove it for you but I would really appreciate not being put in that position.